I’m grateful to be a part of Congregationalist church. Congregationalism is a Protestant denomination with a rich history in Great Britain and the United States. Much of Christianity in colonial New England was Congregationalist, and many leading American theologians in this time were Congregationalists, like Jonathan Edwards. When I realized that my convictions on baptism and church government made me un-ordainable in the Presbyterian Church of America, the denomination in which I grew up, the primary kinds of churches I began to explore were Baptist or non-denominational. Many Baptist churches have a culture that I don’t fit in with, although I would have been very content if the Lord had led us to a healthy Baptist church. And I like being part of a denomination. In an age of doctrinal minimalism and historical short-sightedness, I like being rooted in a specific tradition. It is healthy and stabilizing. In God’s goodness, I’m grateful to have landed in a Congregationalist church. 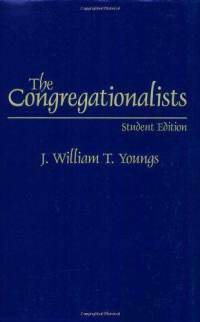 In order to better understand Congregationalism, I have started reading J. William T. Youngs The Congregationalists (Praeger, 1998, student edition). It traces the history of Congregationalism in the United States, beginning with its origins with Robert Browne and independents in the Church of England in the 1640s (such as John Owen) and the Savoy Declaration of 1658, then moving on to its development in the United States, its slow decline in comparison to Baptist, Methodist, Lutheran, Anglican, and Reformed denominations, and the further loss of many of its churches in the 1957 merger into the United Church of Christ. Its fascinating to realize that while Congregationalism may not be as influential a denomination now, it once dominated the American church scene. Most churches in New England in the early 18th century were Congregationalist churches. For example, Youngs writes, “in 1700 there had been only two Baptist, one Anglican, and one Quaker church in Massachusetts; in Connecticut there were no churches that were not Congregational” (7). Congregationalism has also had a massive influence in American history. Congregationalists founded Harvard, Yale, and Princeton, were active in the Abolitionist movement, led the charge to evangelize native Americans, were active in early foreign missions efforts from America, and were at the forefront of the First and Second Great Awakenings. Yet they failed to move Westward like the other denominations, and thus their influence proved largely limited to this early period of American history, and to this Northeastern region of the United States. So Youngs notes, for example, that in 1830 nine-tenths of Congregationalist churches were in New England. In 1850 there were 224 Presbyterian churches in Kentucky and no Congregationalist churches (7). It will be interesting to learn about the history of Congregationalism as I keep reading!